• His father said working for Gandhi was like “living on the face of a volcano,” because there were two sides to Gandhi. One was that of a friend and one was like a volcano that would erupt if provoked, because he was so passionate and strong in his viewpoints. • He was also like this to his wife. • He based his leadership on specific strategies. • He was a part of three big national movements, but the way he got people involved was through satyagrahas. -These were smaller movements in between the larger movements that had achievable goals. -This kept people involved because they felt like they were seeing change happen. • In February 1947, Indian independence was announced by Britain, and the Indian National Congress never called upon Gandhi again. • On January 30, 1948, he was assassinated. • In a letter late in his life he wrote: “I feel there is fire all around me, above me and below me, but inside I only feel calm,” because he felt like God was taking care of him. Q: What do you think is the most important thing about Gandhi? A: Gandhi always said, “My life is my message.” And he followed this. Q: How can people today still hold onto the belief of non-violence, when it doesn’t seem to be working in areas like Tibet for example? A: What is happening in Tibet is important for the whole world because a whole culture is trying to be erased. However, violence is still not the answer, because it will not create a good future. You really have to think about what type of future you want to create. Martin Luther King, Jr. said we only have one alternative to non-violence: non-existence. Q: How did Gandhi transform the lives of people? A: He poured himself into the life of the other person.
" then he worked in the same position for ten years " - Who said that?? Whoever said that is totally false . Narayan Desai said that when he was giving his speech. I could have misunderstood him though; he is very old. I think the confusion causing word is "then". It implies subsequently. That was not the case. Mahadev Desai worked with Gandhi from 1917 till his death in prison in 1942. 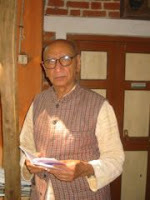 Narayan Desai had joined Gandhi's secretariat probably in 1935 or '36 and worked with his father. After Gandhi's release from prison in 1944, he rejoined the work where he continued till 1946. Thus he did work for ten years but not after Mahadev Desai's death.